We are passionate about color and design. We utilize traditional, handmade materials for our work. We design, cut, embellish and sew unique garments and create one-of-a-kind jewelry to complete the look. We work with fabrics from Guatemala, Africa, and Mexico and then add fabrics from other countries to make our garments. Inspired by the traditional crafts of the Philippines, we bring one-of-a-kind pieces from Filipino artisans who spin indigenous designs into of-the-moment luxury accessories. The result: Globally-inspired statement pieces that blend seamlessly with any wardrobe. Ethiopian Welo Opals are the worlds finest opal. We select, finish and import high quality opal gems that are crafted into amazing settings. 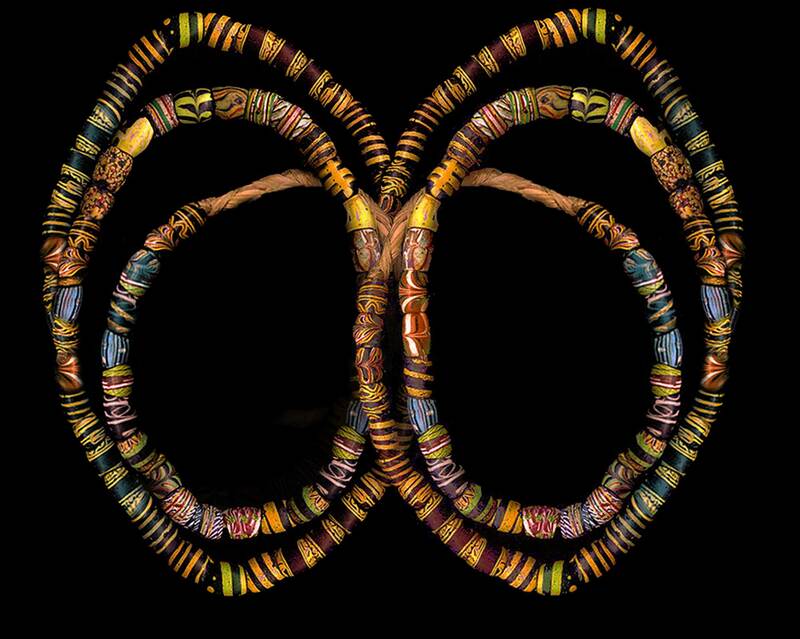 African beads, ancient beads, jewelry and artifacts, rare and hard to find pieces. Jewelry designs inspired by ancient wisdom, myth, legend, symbol and gemstone energetics; timeless designs by Elaine Maginn Sonne. Art clay workshops, mini demos, supplies and jewelry offered by Inez Flaugh. Specializing in one of a kind, exquisitely hand carved wood and bone carvings, beads and pendants. Wholesale supplier of coral , shell, semi-precious gemstones, turquoise, pendants and crystals. Cathi Milligan started her art career in the field of graphic design before discovering glass. Glass has since become pretty much all she thinks about. Her glass experience spans over 22 years, mastering techniques such as torch working, kiln forming, mosaic, and now adding glass blowing. Cathi will be showcasing her art beads, jewelry and decor items. Cathy Burton has been involved in art pretty much her whole life. An introduction to beading led to other mediums including, wire wrapping, metalsmithing, chainmaille, and more. Cathy will be offering in depth classes as well as a full line of art jewelry. Rare indigo blue, hand-dyed silk, vintage German beads, antique hand-cut crystal, one-of-a-kind jewelry designs. Unique Cards, Art Posters, Magnets & Handmade Greeting Cards inspire positivity through humor, wit and encouragement. Elaine's jewelry and wearable art are inspired by ancient wisdom, myth, legend, symbol and gemstone energetics. Elle of California offers The Erica Harris Collection of vintage, antique, and collectible jewelry. Specializing in estate collected Antique Asian ornaments, vintage Italian metal resin beads and design elements, vintage Czech glass, amber, sterling silver, semiprecious pieces, unusual objects, and more. Specialty pearls & gemstone beads. A rare collection of fine beads, gems and hard to find findings. A feast for your beady eyes! Enjoy one of the largest selections of both Czech and Japanese seed beads, ranging in size from 2/0 to 24/0, old and new. We also carry Czech fire polish, shaped glass beads, two-hole beads, beading supplies, how to books, needles, stringing material, findings and so much more! Classically trained in Germanyâ? ?s Idar Oberstein, where the gem cutting tradition goes back to the 15th century, our designer and master craftsman has over forty years of skilled experience. He studies each natural gemstone to determine how to achieve the best possible color and brilliance so our customers will have gemstones of lasting value and beauty. He is familiar with every step from mining to cutting and polishing and transforming gemstones into uniquely-designed jewelry. Delivering the finest quality precious and semiprecious gemstones to jewelry designers; offering exquisite gemstone beads with an extensive choice of composition, shapes, and sizes, and with state-of-the-art faceting. A multiplicity of fine quality, fresh water pearls, and gemstone beads. Heavenly Taste Toffee uses a recipe that's has been passed down through 3 generations. Starting with my Grandmother in Chicago, IL. Metal clay instructor as well as jewelry designer offering handmade pieces and full instructions on how to create your own. Semi-precious & precious gemstones, beads, cabochons, pearls, and more. Excellent quality semi-precious gemstones and beads, offering a grand selection of shapes, styles and gems. The perfect travel bags for jewelry designers and crafters. Importer and Wholesaler of Precious and Semi-Precious Gemstones and Beads and Fresh Water pearls strands as well as half drilled pieces for earrings. We also offer professional classes and workshops and advise on creative design issues as part of our collaboration. As well as unique finished jewelry pieces and one of a kind designs. Handmade jewelry and art wear clothing. Find all your beading accessories, sourcing the best beads and gemstones! Beautiful and inspiring jewelry, handmade silver pieces and pendants. A collaboration between designers Suzi Click and Gretchen Schields, part of the Advanced Style movement which encourages development of your own personal style to express your passions and unique personality. Beautiful clothing, accessories, scarves, beaded tops and more. Beautiful silver jewelry by Inez Flaugh along with workshops and jewelry making supplies. Excellent quality semi-precious gemstone beads, gems, and pearls. Natural stones from Afghanistan hand cut and shaped into beads in various sizes, shapes and styles. Sunlight Gems believes in the importance of high quality, competitive prices and prompt delivery on precious and semi-precious gemstone beads. Art clothing: Skirts, Jackets, Dusters, Kit Short, Maddie Patch, Alexa Fine Lace and more. Jewelry-making classes,handmade jewelry, jewelry tools, wire, findings, chain, cord and other supplies. Susan Ryza teaches jewelry-making & fiber crafts at Santa Monica College, various local Santa Monica schools & stores, & at her home studio. She also designs & fabricates hand-crafted jewelry using a variety of materials, including wire, cord, gemstones, Swarovski crystal, plate metal, chain, fabric & ribbon. As a jewelry teacher as well as a designer, she loves learning & incorporating new techniques & methods – among them chain maille, bead weaving, wirework & bead stringing. She has a BFA from Rhode Island School of Design, and an MS in Education from Long Island University. Having a textile design background, she especially enjoys adapting fiber techniques for jewelry – using macramé, crochet, spool knitting, netting, weaving, knotting & braiding. Our empowering gemstone jewelry consists of simple, powerful designs that symbolize the twists and turns of life itself. Every piece is perfectly complimented with energetic custom cut gemstones that vibrate with your body's own energetic frequencies. Exceptional high quality stones, gems and beads as well as jewelry designs. The Cave has a unique collection of "one-of-a-kind" contemporary jewelry along with an unusual selection of gifts. We invite you to explore and discover these creations which are created by our European designer. This is a classically-bold collection of earrings, bracelets, rings and necklaces which is extraordinary in their elegant simplicity. Come learn about glass! Classes! Supplies! Art and Jewelry! One of a kind jewelry designs made with precious gems and stones. High quality handmade jewelry and fashion accessories using semi precious stones, sterling silver, gold filled, and gold plated. Amazing bold pieces inspired by nature.